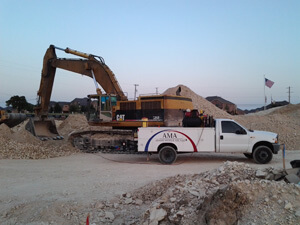 Adams Mobile Air supplies and services HVAC systems for compact equipment, dozers, graders, backhoes, skid steer, loaders, telehandlers, excavators, off-road trucks, and other construction machinery used worldwide. Our after-market installation of heaters and air conditioners set the standard for performance and durability in the heavy-equipment business. We have designed, tested, and installed many HVAC systems to meet the rigorous heat-load, air-flow, vibration, and filtration/pressurization demands that construction machines face every day. We can work from a clean sheet or design a system to fit an existing space. Either way, we have the expertise to deliver the value of reliable, effective climate control to construction equipment cabs. For our customers who are owner/operators, manufacturers, and dealers with specialty equipment or own vehicles not originally equipped with heating, air conditioning, or filtration, our highly qualified team at Adams Mobile Air can work with a variety of parts vendors to procure and install the proper components to meet the HVAC needs of their operation. Equipment we service includes Caterpillar, Komatsu, Volvo, Kawasaki, John Deere, Kobelco, Hitachi, Case, New Holland, etc. Adams Mobile Air has established an accomplished reputation and is the capable and competent choice for exceptional HVAC product support, service, and experience in heavy-duty markets.